It’s time to end this losing streak. Holy Quarterback Change, Broncos Country! What a week for our Ultimate Fan to have to preview the game - unprecedented three-game losing skid (well, recently anyway), new QB, excitement-plus-sadness in the locker room, NFL’s best team on the docket...lots to process! Luckily our new-to-UFG author this week is up to the task and totally ready not just for this game but for what the Broncos have in store the rest of the season now that Brock Osweiler is at the helm. A North Dakota native, broncobender is a fan of Carson Wentz, but he’s been a Broncos fan since a certain legendary game in 1998, so we know he’s all in on this Broncos team taking down the team with the best record in the league right now, the Philadelphia Eagles. MHR – Wow. When you signed up for this game, did you have any idea you might be talking about Brock Osweiler as the starting quarterback?? How do you feel about that? broncobender: I'm really worried. I was expecting the Trevor Siemian vs. Carson Wentz battle and had some ideas to talk about. Now we are hoping to tread water until Paxton Lynch comes in when we start evaluating him and his progress. I don't want to think this is going to be a wasted season, but my optimism is running out quick. broncobender: With the change at QB, hopefully it revitalizes our offense and we pull out a close win. Both defenses are good, so it should be low scoring unless Brock coughs the ball up. If he protects the ball, we have a decent chance at an upset. MHR - The Eagles have a great run defense and are actually No. 1 to the Broncos’ No. 2. How should that influence the Broncos’ game plan this week in utilizing C.J. Anderson, Jamaal Charles and Devontae Booker? broncobender: Keep running the ball. Go with the hot hand, and don't back down. Maybe try and scheme some new looks to confuse them. I would like to see some creativity to the plays. We can't go away from the run game though. Getting one dimensional will be bad news for Osweiler. We need to stay balanced. MHR - For Osweiler’s first start as a Bronco since 2015 - with rather unsuccessful stints in between at the Texans and a short time at the Browns - how can Mike McCoy get him comfortable as the starter after just joining the team two months ago and serving as backup until Tuesday? broncobender: Give him some early confidence building plays. Short slants, screens, run the ball, get some positive yardage. If we start off moving the ball, Brock will get more comfortable if we can show that we can move the ball. MHR - What will bringing Osweiler in this week do for the Broncos offense in your opinion? What do you think it could do for the entire team? broncobender: As most know, our defense is frustrated with how our offense was playing. We needed a change, and I think with that change our team is going to play with a new fire. The defense is going to have hope again, and our offense is going to work hard to make sure Brock is having success. If Brock was humbled by all that happened to him, he should realize his role and what he needs, so I think our offense will do well. MHR - What kind of change-ups in the offensive game plan would you like to see (either generally or in specific types of plays?) to take advantage of Osweiler’s strengths? broncobender: I want to see some deep attempts. DT is great at getting PI calls against him. Have Brock throw some deep balls his way. We've been sorely missing that aspect of our offense. DT used to be good at 50/50 balls, so use that to our advantage. MHR - Carson Wentz is having a great year, throwing 19 TDs to his 5 INTs - already a huge improvement over his rookie year last season (16/10). One of his few flaws is to hold on to the ball too long. How can the Broncos’ defense - particularly the edge rushers - take advantage of this young QB? broncobender: Never give up, be relentless. Since he holds the ball longer, Von, Barrett, Wolfe and Ray need to keep pounding and try and find ways to disengage from their blockers and take down Wentz. Since our corners are still stellar, they need to stay on their receiver to give the rushers that extra time. MHR - The Eagles offensive line is not all that much better than the Broncos and now that Jason Peters is out for the season after a knee injury, that could spell more trouble for Wentz. How should Von Miller, Shaq Barrett and Shane Ray be able to use that this week? broncobender: Punish their LT! Give him a welcome to the NFL moment. Joe Woods should throw exotic blitzes at them to generate confusion and free up rushers. We should be able to get a lot of pressure this game. MHR - The Eagles have a big-time QB in Wentz but not any major receiving threats. How does this play into the hands of the No Fly Zone’s strengths and how do you see that unit matching up with the Eagles’ passing offense? broncobender: I want to say we have the advantage but seeing how the Bills played us, I can't be so optimistic. If the corners play man coverage and let the pass rushers do what they do, we should be good. Our complementary defense is something to behold. I think the Eagles have their lowest scoring day against us. MHR - The Eagles added Jay Ajayai to their rushing attack this week, but that new strength will go up against the Broncos biggest strength this year - its run defense. Who wins that battle this weekend?broncobender: Broncos D. We have shut down opposing rushers ALL season. I think combined they will get around 70 yards on 25 attempts. We should be able to shut them down. 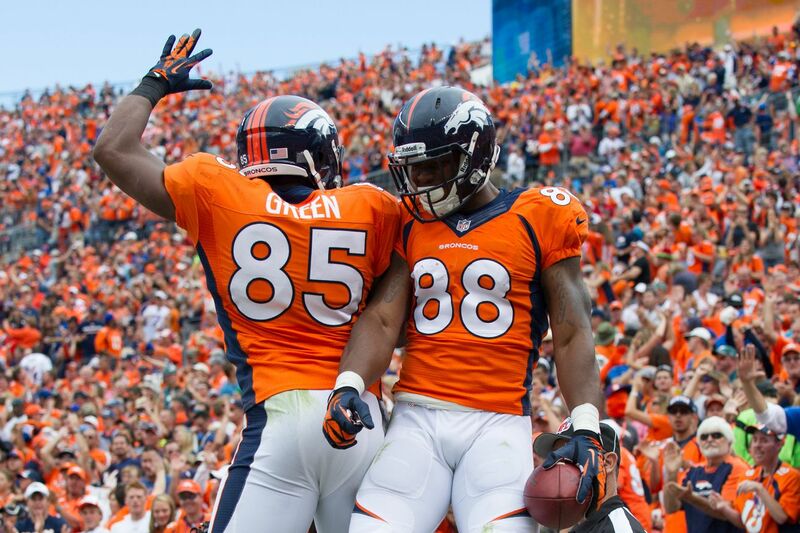 MHR - For the Broncos defense, the achilles heel is always the team’s tight ends. The Eagles have a really good one in Zach Ertz. Assuming his hamstring is healthy, how do the Broncos cover him effectively? broncobender: Double cover him? Put Aqib Talib on him? That's what we have been saying, but it doesn't happen and I don't see it happening. We will continue to play our sane game, and Ertz will get 100 yards on us. Luckily, he will be the only one to get yards on this defense. MHR - The Broncos are coming off a three-game losing skid and some low team morale overall. Although we only like to predict wins from this team, what would be considered a successful game for the Broncos on Sunday? broncobender: To see our offense not have any turnovers. Plain and simple. If we protect the ball, it will give us the chance to win the game every time. What's @bosweiler17's No. 1 priority for #DENvsPHI? "@VonMiller is the best guy I've ever seen on tape ... There's nobody that can really compare to him"
Favorite Broncos game EVER? 2012 comeback against the Chargers. It was then we knew Manning was back and that there were special things ahead for us Broncos fans. But Super Bowl 50 also holds a close place in my heart. Game most looking forward to this season? This one. I'm from Fargo, N.D., so I have been watching Wentz play since college. I'm happy for him that he is growing and making a name for himself in the NFL. Yay for North Dakota! Game you think will end up being most important this season? Chargers game when we were shut out. Changed the outlook of our team and our future. Favorite new guy/rookie on the team? Domata Peko - with him and Adam Gotsis on our line, our run defense has greatly improved. Superstitions on game day? None. Favorite Von Miller sack dance? All of them! Least favorite game analyst/commentator? I don't really listen to them. Philly cheesesteak or cheeseburger? Philly cheese steak. Alex Smith went 1-3 for five yards when targeting @ChrisHarrisJr, per @PFF. #Broncos defense is holding up their end of the deal. How did you become a Broncos fan? Oh gosh, as a young boy I was watching football with my brother and dad. The Broncos and Packers Super Bowl was on and they were rooting for the Packers, so I decided to root for the Broncos. Orange and blue happened to be my favorite colors. After that win, I started paying a little more attention and when Super Bowl XXXIII came, I again rooted for the Broncos. After that win, I was hooked and have been following them since - even through the rough years.